Karl Schwarzschild was a German physicist, best known for providing the first exact solution to Einstein's field equations of general relativity in 1915 (the very same year that Einstein first introduced the concept of general relativity). His work generated many original concepts which now bear his name, such as Schwarzschild coordinates, the Schwarzschild metric, the Schwarzschild radius, Schwarzschild black holes and Schwarzschild wormholes. 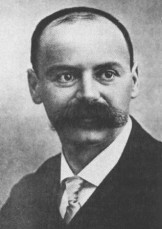 Karl Schwarzschild was born on 9 October 1873 in Frankfurt am Main, Germany, the oldest of six children. The family was Jewish and quite well-off, his father being a respected member of the business community in Frankfurt. Schwarzschild attended a Jewish primary school in Frankfurt up to the age of eleven, before entering the Gymnasium there. He was something of a child prodigy, constructing his own telescope and publishing a paper on celestial mechanics (specifically, on the theory of orbits of double stars) when he was only sixteen. He studied at the University of Strasbourg from 1891 to 1893, where he learnt a great deal of practical astronomy, and then at the University of Munich where he obtained his doctorate in 1896 with a work on Henri Poincaré’s theories. From 1896 to 1899, he worked as an assistant at the Kuffner Observatory in Vienna, Austria, and then spent two years lecturing at the University of Munich. From 1901 until 1909, he was a professor at the prestigious University of Göttingen, where he had the opportunity to work with some significant figures, including the mathematicians David Hilbert and Hermann Minkowski, and where he also became director of the Göttingen observatory. In 1909, he married Else Posenbach, and they had three children, Agathe, Martin and Alfred. His son, Martin, born in 1912, would also become an eminent physicist whose work led to greater understanding in the fields of stellar structure and stellar evolution. In 1909, Schwarzschild moved to a post as director of the Astrophysical Observatory in Potsdam, the most prestigious post available for an astronomer in Germany at that time, and in 1913 he was elected a member of the Berlin Academy of Science. In 1914, at the outbreak of World War I, he joined the German army, despite being over 40 years old, serving on both the western and eastern fronts, and rising to the rank of lieutenant in the artillery. While serving on the front in Russia in 1915, he began to suffer from a rare and painful skin disease called pemphigus. Despite serving in the war and suffering this painful debility, Schwarzschild nevertheless managed to write three outstanding papers during in 1915, two on relativity theory and one on quantum theory. His papers on general relativity produced the first exact solutions to Albert Einstein’s field equations, and a minor modification of these results gives the well-known solution that now bears his name, the Schwarzschild metric. Einstein himself was pleasantly surprised to learn that the field equations admitted exact solutions, partly because of their prima facie complexity, but partly because at that time he himself had only produced an approximate solution. Schwarzschild’s more elegant "polar-like" coordinate system (which has since become known as Schwarzschild coordinates), based on a spherically symmetric space-time, was able to produce an exact solution. Schwarzschild’s solution identified a radius for any given mass, known as the Schwarzschild radius, where, if that mass could be compressed to fit within that radius, no known force or degeneracy pressure could stop it from continuing to collapse into a gravitational singularity or black hole. Thus, where the radius of the body is less than its Schwarzschild radius, everything, even photons of light, must inevitably fall into the central body. As a corollary, when the mass density of this central body exceeds a particular limit, it triggers a gravitational collapse to what is known as a Schwarzschild black hole, a non-charged, non-rotating black hole. A general acceptance of the possibility of a black hole did not occur until the second half of the 20th Century, and Schwarzschild himself did not believe in the physical reality of black holes, believing his theoretical solution to be physically meaningless. Although Schwarzschild's best known work lies in the area of general relativity, his research interests were extremely broad, including work in celestial mechanics, observational stellar photometry, quantum mechanics, instrumental astronomy, stellar structure, stellar statistics, Halley's comet and spectroscopy. In particular, earlier in his career, he pioneered the measurement of variable stars using photography, and worked on the improvement of optical systems. Schwarzschild's struggle with pemphigus may have eventually led to his death, although the actual circumstances are unclear. He was invalided home from the Russian front in March 1916 and died on 11 May 1916, at the age of 42.